I've never really been a big fan of Hawkeye. It's probably because I never really got into the Avengers -- a team that I usually describe as "Marvel's most popular characters and Hawkeye" -- but while I can talk for days about Thor, Captain America and Iron Man, something about the team's resident archer never clicked. So for Matt Fraction and David Aja's new Hawkeye series, a book I really have been looking forward to, I can't tell you if the people who already love the character are going to enjoy it. What I can tell you is that Fraction and Aja have definitely come to the plate with a Hawkeye that I do like, and that I want to read more about. 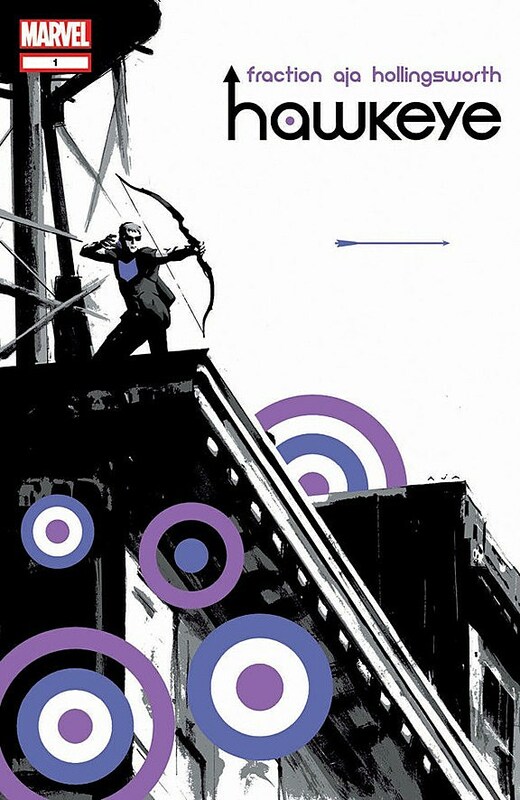 In an interview here at ComicsAlliance, Fraction talked about his approach to Hawkeye and how his high concept for the book was that he's "the Avenger that's Just A Dude." It's that concept that he builds this entire issue around, tying everything to that one theme and fitting it all together really nicely. It's not just that the opening scene is Hawkeye being tossed out a window and getting banged up pretty badly to show his relative vulnerability -- but done with a nonchalant kind of weariness that characterizes him as a guy for whom this happens all the time -- but right down to the actual plot. 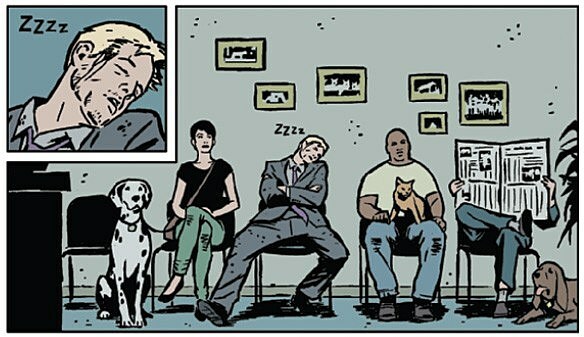 When you get right down to it, Hawkeye #1 is a comic about a guy dealing with two problems: His landlord's hassling him about the rent and his dog needs to go to the vet. There's a big fight scene with some gunshots and an example of Clint Barton's talents thrown in there, but mostly it's the landlord and the dog. Even though they're amped up a little, those are Just A Dude problems, and in almost any other comic they'd be the most frustrating thing in the world to read about. Nobody wants to see Thor or Superman trying to fix a busted air conditioner, because those guys have the ability to go out to space or punch out mad gods from the aeons when Earth was young. Here, though, those problems set the tone for the human being who has to deal with them. Even though I'm not a big fan from way back, I know that Hawkeye's been an Avenger for almost 50 years. He's been to space, he's fought Ultron, he's come back from the dead at least once -- hell, he used to ride around on a flying snowmobile. He's about as far as you can get from what we usually think of as a "street-level" hero, and Fraction and Aja are smart enough to not present him as such. Instead, you get the feeling that Hawkeye is what he's doing between issues of Avengers; that he's a guy who finishes up super-heroing for the day and heads home to his apartment. Not because it's a Bold New Direction™ designed to make the character easier for the movie-going audience to relate to (although that's certainly a nice side effect and one that I imagine Marvel has no problem cultivating), but for the simple fact that he doesn't have a helicarrier or a billion-dollar robotics corporation or an eternal mead hall in the Golden Realm of Asgard to go back to. The concept of "Hawkeye on his days off" that's laid out in the title page fits this book like a glove, and it's a pretty interesting choice. After those first few pages where he gets knocked out of a building, Clint doesn't wear his costume and nobody refers to him as "Hawkeye." Instead, he's just Clint Barton in a suit -- an actual suit with a shirt and tie, not the purple leather that makes him look like Prince's racquetball partner -- dealing with things on a relatively low-key level. Rather than, say, the Loki level that he has to deal with at his day job. Hawkeye is an interesting change for Fraction, too. The ideas that he's launched his other Marvel books around have always felt bigger, louder, more dazzling. His Iron Man run kicked off with a story about Tony Stark living under the shadow of having built weapons, even with the best of intentions, and how that guilty past can haunt him forever. His Punisher run took a look at what it would be like for a person who was consumed by hate for criminals to live in a world where the criminals wore animal costumes and called themselves things like "The Mandrill" and "Stilt-Man." Even his last project with Aja, Immortal Iron Fist, centered on an idea he called "kung fu billionaire" and opened up with the title character jump-kicking a giant robot spider off the side of a building. But while Hawkeye's a little quieter, it's no less tied into a central idea, and that's what makes it so fun to read. The "Just A Dude" thing comes in clear as a bell from the opening sequence, and even the "Next Issue" blurbs refer to it as "A Clint Barton Hawkeye Adventure," giving the story a kind of pulp novel/private eye feel. Taking that cue from Fraction, Aja gives Clint Barton a sort of rumpled weariness in response to all the hassles that life's presenting him. Somehow it fits with a guy who's seen everything up to and including alternate dimensions, but also casts Clint in a pretty distinctive light. In a lot of ways, the artwork by Aja and colorist Matt Hollingsworth makes Hawkeye feel less like a traditional super-hero and more like a sort of pulpy detective character. For him, everything that happens in the book is a pain, but it's something he deals with because he wants to help the people around him, to the degree that he's driven to do so even on his days off from literally saving the world. To be honest, I do hope that a little more of the traditional super-hero aesthetic makes it into the book, especially if it involves that flying snowmobile. I like seeing that stuff pop up, and if Immortal Iron Fist taught us anything, it's that Fraction and Aja are pretty great at presenting it. 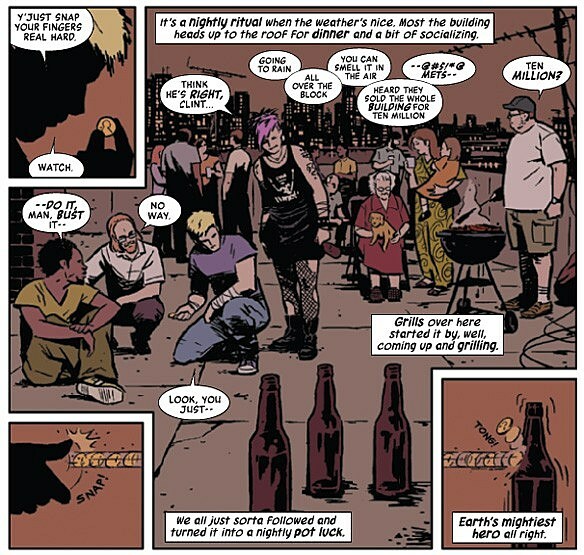 And in fact, while the story is self-contained as an introduction to the character -- something a lot of other creators doing a first issue could take a cue from -- there are hints at a bigger overarching plot set to come along later in Hawkeye, and Fraction mentioned wanting to find Clint an arch-nemesis. But for this issue, to establish their take on a character in a way that feels distinct and engaging, Hawkeye #1 works almost perfectly. It's "The Avenger That's Just A Dude" without falling into the trap of being boring or making Hawkeye seem lesser for not having a magic hammer to swing around. It's solid stuff, and "Avenger by day, Jim Rockford by night" is a concept I can get behind. Hawkeye #1 is on sale now in finer comics shops and digitally via comiXology.